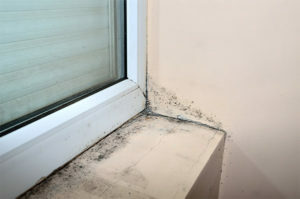 Mold can’t grow without moisture, tackle wet areas right away. Seepage after a heavy rainfall, accumulation from a leaky pipe, even a spill on the carpet should be dried within 24 to 48 hours. Don’t leave wet items lying on the floor; make sure to dry walls after a shower. Don’t leave wet clothes in the washing machine where mold can spread quickly. And listen to your mother, use a coaster under your drink! To increase circulation, open doors between rooms, move furniture away from walls, and open doors to closets. Let fresh air in to reduce moisture and keep mold at bay. Routine domestic activities like cooking dinner, taking a shower, and doing a load of laundry add a lot of water vapor to your indoor spaces. Vent appliances that produce moisture — clothes dryers, stoves — to the outside (not the attic). Use AC units and dehumidifiers; your energy-efficient home may be TOO efficient to allow your home to breath. Building a new home or renovating an old one? Use products like mold-resistant drywall and/or mold inhibitors for paints. Traditional drywall is composed of a gypsum plaster core pressed between piles of paper. Focus on areas prone to wetness, such as bathrooms, laundry rooms, basements, and kitchens. Mold-resistant gypsum board is also available; the core of the drywall is developed in such a way to prevent moisture absorption, and thus prevent mold growth. Don’t ignore fogged windows, wet window sills or steamy mirrors. You can detect high humidity with vapor on windows, pipes, and walls. An indoor humidity monitor will help you keep track of moisture levels for less than $20; more sophisticated models that simultaneously and remotely track several rooms can climb to $200. If the ground around your home isn’t sufficiently sloped away from the foundation, water may collect there and seep into your crawlspace or basement. Have your roof gutters cleaned regularly and inspected for damage. Keep an eye out for water stains after storms that may indicate a leak. Moist soil in indoor plants is a perfect breeding ground for mold, which may then spread to other areas of your house. Check under and behind the plants; remove dead leaves and loose dirt. Instead of getting rid of your plants, try adding a bit of tea tree oil to the water you give to your houseplants to hinder mold growth in plant soil. Cast a critical eye on household clutter, and pare down your stuff. Clutter blocks airflow and prevents your HVAC system from circulating air. Furniture and draperies that block supply grilles cause condensation. All this moisture creates microclimates in your home that welcome and feed mold growth. Shut the front door when you use the A/C. When you open windows and doors, you let air conditioning escape, waste money, and invite humid air into your cooler home. This causes additional condensation, which mold loves. Call ERX Emergency Restoration Experts as soon as you find mold in your home. The team will get to work with the latest technology to decrease drying time, reduce damage, and get your life back to normal. In the Las Vegas area, ERX Emergency Restoration Experts has an emergency line for 24-hour service. We are ready when you need us!